A new year means new musical horizons here at the Bordello. Curses formed his sound in the distortion and sweat of back alley dive bar bars amidst the crash of guitars and the audible gulp of beer. Hints of disco and wave balance this rougher edge, smoothing down those creased lines for a style that adheres to no boundaries. 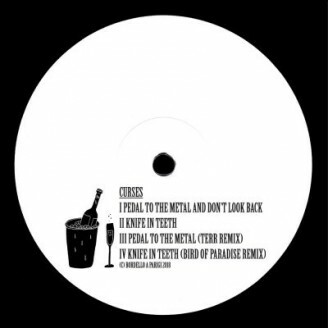 “Pedal To The Metal And Don’t Look Back” is a perfect introduction to Curses’ multifaceted sound. Beats orbit burbling bass and brash strings in a work of dreamy hypnotics. “Knife in Teeth” comes from a similarly shadowy lair. Dark bars are further inked by industrial percussion in a track born on the factory floor to strict EBM parents. Terr takes on “Pedal To The Metal And Don’t Look Back” and does the original proud. Bass rumbles to the tune of a guttering engine before lighter notes take hold. Murky currents are cleared by bright synth blasts in this uplifting remake. The Bird of Paradise closes the EP with his psychedelic take on “Knife in Teeth.” Drums take on a more sinister tone as tribal rhythms give rise to jungle imagery and the immediate threat of what might lurk behind those supposedly innocent sounds.